New England Culinary Institute offers a robust selection of online courses from our degree and continuing education programs, each tailored to concepts and issues relating to the hospitality industry. Select from the list of upcoming classes below to see a full description of the course! In this course, students will research and examine the evolution of food consumption around Western Europe, and examine the character and substance of regional cuisines. Furthermore, by defining the characteristics of cuisine, students develop a template on which to research future cuisines. By analyzing the: Climate, geography, cooking techniques, eating habits, flavors, and origins of ingredients, students gain a deeper understanding of the connection between cuisine and culture. The course will expose students to the concept of terroir: “Taste of Place” and will provide an introduction to traditional flavor profile, cooking techniques, as well as the preparation of traditional dishes. This course features discussion, research, and cooking labs. Dry curing is a method used for thousands of years to preserve meat and fish. Presently, dry cured meat products, such as fermented sausages, dry-cured hams, and air dried beef are sought after and appreciated for their sensory characteristics, depth of flavor and the variety they bring to restaurant concepts and individual menu items. Despite being traditional products, they are constantly evolving in order to meet the needs of changing markets and public tastes. Knowledge of the effects of a variety of raw materials, ingredients and processing methodologies is vital in order to achieve high quality finished products and maintain consistency despite the many variables involved. In this class, students will learn to make a variety of ground and whole muscle dry cured sausages, hams, shoulder cuts and bellies, along with the full utilization of all parts resulting from whole hog butchery and from appropriate cuts of beef, fish and game. In this course students learn and practice advanced culinary techniques, requiring a higher level of accuracy, detail, and refinement than in previous classes. Students will learn advanced applications of the fundamental cooking skills learned in previous classes and execute them with refinement and finesse. Emphasis is placed on mastering the selection and application of cooking methods, understanding the role of seasonal ingredients, organization, prioritization, timing, and menu planning. 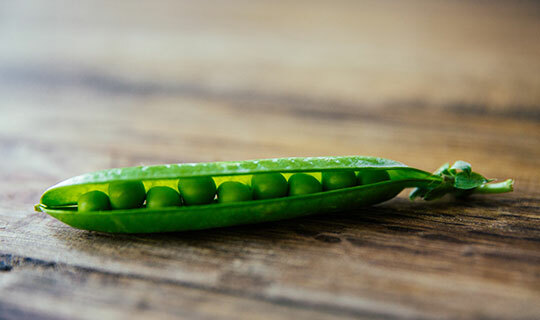 Using our mission of responsibility and sustainability as a guide, students are challenged to assume greater responsibility in preparing food to exacting standards. This lab-based course introduces students to the advanced techniques and skills associated with great pairings of fermented beverages and food. Through exploration and application of theory students will begin to identify critical characteristics in food and wine that directly impact their pairing. Throughout this course students will explore and experience single dish and multi-course pairings, as well as flight offerings. Key areas of study will be the exploration and understanding of the impact culture and terroir has on regional pairings, the role that sensory perception influencers have on food and wine, how the attributes of food and wine can affect pairing, and how the production of wine and the technique and method employed on the food can influence taste, flavor, texture and appeal of pairings. Additional focus will be spent exploring the elements of successful menu planning skills and techniques associated with wine and food pairings. Building on skills gained in Introduction to the Butcher Shop, Meat, Poultry and Fish Fabrication, students will work on a wider variety of proteins, as well as learning the processes of sausage making, hot and cold smoking, and making a variety of prepared foods for restaurant, non-commercial and retail sale. Fresh and smoked sausages, a variety of hot and cold fish and shellfish, value added pork, beef and poultry deli meats, and a variety of prepared menu items will be included. Additionally, students will gain certification after completing four modules focused on beef: ranching, cattle feeding, processing and grading, and fabrication and distribution from the Ranch to Table educational program that will earn continuing education credits from the ACF. This class takes viennoiserie to the next level. Students will explore working with different flours, compound butters as well as inverse puff pastry and laminating brioche. As the level becomes more technical, students will be encouraged to explore current trends in this field with a view to mastering this creative and challenging skill. The overall aim will be for students to refine and hone their existing skills as well as improved accuracy and technique. Today’s Baking and Pastry professional is likely to encounter a variety of allergen and special diet requirements when preparing food for the public, be it customers, family or themselves. Understanding alternative ingredients and technique variations to respond to these demands is becoming a necessity, not an option. Through ingredient exploration, foundational theory analysis and actual production students will research and develop a range of baked goods to meet this increasing segment of the foodservice industry. Students study a range of visual aesthetics, including the use of color, light, shapes, and textures. The primary focus of this course is the exploration of basic visual design concepts and successful applications of these concepts in a variety of settings, including multi-media production. Part I is a six-week exploration of line, form, color, and the use of negative space. Part II is a six-week applies these theories in a video production environment. The course offers the student the opportunity to get behind the scenes at a television studio and learn how video production works. Students will participate in all aspects of production, from production planning to running cameras and sound equipment, to presenting in from of the camera. Students will understand various types of video productions including interviewing, news stories, and product presentations. This hands-on class builds on the methods and techniques acquired in Semester 1. Through a series of lectures, demonstrations and lab work, students will learn the science and art of Artisanal Bread making. They will explore different techniques, pre-ferments, as well as international breads. Students will have a thorough foundation in bread history and production culminating in a complete grounding in this subject. Examples include Pain au Levain, Ciabatta and classic French Baguettes. This course will explore the history of beer and spirits production from ancient times to the present. The curriculum will cover a broad spectrum of beer products to include various ales and lager, and distilled products to include whiskey, vodka, rum, gin, tequila, brandy and the different types of liqueurs. Analysis of the raw materials for each beverage, along with production regulations and techniques will give students an understanding of the uniqueness and diversity of the worlds’ major categories of distilled spirits. In addition, current trends for each beverage category will be highlighted in order to give students perspective on the evolving elements of the food and beverage industry where careers will be focused. The online delivery will include narrative content, videos, web links, podcasts, screencasts and other technological teaching tools in order to deliver a multi-faceted approach to learning. This course is designed to provide students with a broader understanding of the bar and beverage industry. Students learn the unique history and production methods of wine, beer and spirits. Product knowledge is developed through both in-class tastings and outside reading assignments. Current trends are a focus, including the strong evidence that today’s consumers are “drinking less, but drinking better”. The course allows students to develop a viable beverage program of their own. Branding plays an imperative role in the 21st century consumer, driving loyalty and business by aligning with the customer’s perception of oneself. This course explores the power of brands across the hospitality industry on guests, associates, and management with special emphasis on the translation of brand aspirations to experience creation, delivery to guests, and the future role of a brand in general. Initial investigations explore the components of a brand, from its mission and positioning, to defining target and aspirational audiences. Students will assess the ideas behind rendering big-picture values into sophisticated experiences for guests at planned moments, as assessing brand meaning, brand positioning, brand analytics, evaluating brand extensions, assessing brand strength, defending premier brands, repositioning mature brands, and building brands via non-traditional media (e.g., social media). The purpose of this class is for students to understand hospitality management from the perspective of the financials. Students will learn and understand the essential steps of the accounting cycle from journal entries to financial analysis. As a result, students will gain insights as to how to better manage the financial performance of a business. The class will utilize the library and Internet resources, Restaurant Start Up and & Growth Magazine, and the RestaurantOwner.com website. Using a restaurant income statement as the starting point this class will explore ways to manage revenue and expenses, adding systems, methods and procedures to the student “toolbox” each week. This class will serve as a foundation for management decision-making as the student begins to understand how financial indicators are used to create action plans for improving both the guest experience as well as operational efficiencies. The student will be proficient at reading and analyzing financial statements by the conclusion of this class. Students will be expected to complete all readings and homework assignments before coming to class. This will require an understanding of basic math and performing various calculations using formulas. Readings and assignments will create an opportunity whereby financial information will be presented in the context of this industry. Case studies and current events will be used to further exemplify key ideas. The use of industry terminology will be a side benefit of the course. This course provides the opportunity for the synthesis and application of content learned throughout the degree program. Choosing from several alternatives, and using the ADDIE model, students will interpret, document and complete a project that demonstrates application of concepts presented throughout the degree coursework. The intent of this Project is to further the skills and attributes that you developed as part of the program as well as give you the opportunity to display your own prowess as an industry professional. The object is to make a difference, however small, in how you influence your industry world. Through independent research, support from your peers and myself, and utilization of previous program content, you will be asked to design one choice of three major projects that address different areas of the food service industry. The intent of this Project is to further the skills and attributes that you developed as part of the program, as well as to evidence your ability to develop and implement a major industry based project. In other words, this project is as much about organization, analysis and follow-through as it is about performing the tasks. Students are introduced to the concepts and strategies that are critical to team management and group collaboration. Students explore the central tenets of group dynamics and oral communication and practice the skills needed to be successful leaders, integral team members and effective communicators. Focus is placed on organizational strategies, effective meeting management, personality typing, problem solving and team building exercises and on listening, analyzing and navigating difficult situations. Students practice and incorporate these skills by taking on both leadership and team member rolls within the classroom, and by designing and delivering effective presentations. Building on foundations learned in semester 1, this class will focus on ingredients and intermediate skills required in making pastry and desserts. Students will learn how to use ingredients necessary for special dietary concerns. We will focus on de-constructing the classic dessert and re-inventing them with a contemporary feel, complete with appropriate garnish, as well as leaning the art of presenting a Viennese Table. Some skills learned in the class will include: mousse types, butter cream varieties, and custard as well as other fillings. Students will concentrate on making classic cakes, tarts and individual pastries and explore the art of plating and innovative plate design. This course is designed to focus student thinking on critical issues facing managers and leaders today. In today's business environment, managers must make crucial decisions regarding employees, the business, and the surrounding community - or should they? This course gives students the opportunity to apply business principles learned in previous courses to organizational settings. Students consider the implications of their decisions in establishing a new business as well as the issues involved in re-energizing existing businesses. Course discussions center on organizational and operational systems (should we change the one that's in place? ), problem identification (which is really the hard part), and strategy redirection. The underlining themes are entrepreneurship and intrapreneurship, small business leadership, and the process involved in making decisions about critical events -- foreseen or not. Additionally, human behavior is examined in the context of leadership and management. Understanding the ingredients, procedures, and underlying principles of cooking techniques are essential to the success of culinary professionals. A chef is responsible for training and supervising a safe, skilled, and efficient staff. To do this requires and ability to understand the “how” behind what we do in the kitchen. Understanding the nature of food and how it reacts when cooked enables a chef to interpret, adapt, and create recipes with confidence. Culinary Foundations is designed to help students understand the relationship between practical cooking applications and theoretical information, especially as they are related to understanding and following recipes in a professional kitchen. Areas of focus include basic knife skills, vocabulary of cooking, and the fundamentals of starch, vegetable, and protein cooking methods. In this class, you will learn about food groups from both a scientific point of view and a cooking point of view. You will learn how best to maximize flavor and texture (while retaining the nutrient profile of a food) when working with protein, whole grains, dairy, fats, fruits, vegetables, and beverages. You will learn how to add flavor while limiting salt and added sugar. You will learn the diet recommendations and limitations of various age groups- children, adolescents, pregnant women, and seniors, plus the special requirements for athletes. Classes will cover how to be a successful food coach using motivational interviewing and how to set up your own food coaching business. In this class, students will learn why people eat, the political influence on our food supply, how to interpret the latest nutrition news, how to communicate nutrition messages to individuals and groups, plus sustainability and why farm to table is gaining in popularity. You will learn how different foods affect one’s risk of developing obesity, cancer, diabetes, osteoporosis, heart disease and intestinal diseases. You will be able to determine which specific diet should be used to both prevent and reverse disease including vegetarian diets. You will learn how to prepare those diets from recipe and menu building, to preparing crave-able dishes. Entrepreneurship requires innovation, strategy, reiteration and execution. Within this process it also demands aptitude with the language of commerce. Entrepreneurs must be able to speak fluently with those who fund, oversee, and support them about the financial dynamics of their operations. This course teaches essential financial terms, tools and concepts. We will cover the entrepreneurial process, key accounting terms/concepts, valuation, expectations of investors/funders and the practical application of these topics to financial planning and performance analysis. Students will become familiar with financial statements (income statements, balance sheets, statements of cash flows) and with related accounting issues. While learning key concepts and practices, students will apply this knowledge by constructing integrated financial plans for proposed (or hypothetical) ventures. The essence of entrepreneurship is starting something from nothing. The journey of taking an idea from its conceptual stage and turning it into a product/service applicable to the marketplace demands a comprehensive understanding for the different components of starting a business. This course teaches about the fundamental concepts, processes and tools of starting an entrepreneurial venture, with an emphasis of developing a business plan from concept. We will cover the entrepreneurial perspective (challenges, characteristics, self-assessment), starting a new venture, developing the business idea, the business plan, including the marketing/financial/organizational plans, financing the new venture, managing the new venture and coverage of issues such as legal, franchising and international entrepreneurship. An intensive exploration of enduring theoretical issues in ethics such as relative and absolute moral laws, subjective and objective components of moral knowledge, the relation of facts in nature to human values, the moral concepts of goodness, right, and obligation and the ways in which they operate in society, religion, law, and the use of reason in forming ethical decisions. This course offers a complete overview of the wines of Western Europe. The emphasis will be on France, with in-depth coverage of each of the six major wine regions, as well as emerging French Wine Regions. Also covered are Italy, Germany, Spain and Portugal. For each country, there will be background on history and quality control laws, and then discussion of important regions of each country, with description of each region’s terrior, and the style of its wines. We will also touch on the position of European wines in the international marketplace. The objective is to prepare BA students for the planning of wine programs, either on premise, or at retail, that can incorporate an interesting selection of quality wines from all premier wine-producing countries. The online curriculum will include narrative content, videos, web links, podcasts, screencasts and other technological teaching tools. This course is designed to instruct students in what has become a distinct model of performance assessment- the learning portfolio. The course requires you to read materials, apply analysis and critical thinking skills, and demonstrate writing skills that evidence the ability to meet the technical standards of the Programs. Students will learn to demonstrate their progress, articulate their knowledge and gain insight into the standards of what constitutes college-level study when applied to out of classroom experiences. The course is designed to assist you in contextualizing what you have learned through engaged scholarship, internships, training programs, and experiential learning. This course will allow you to attach specific goals from the NECI Active Standards to your learning process in an independent setting. The focus is to help you develop an experiential learning portfolio that illustrates in a meaningful way your out of classroom experiences. The course will assist you in assigning meaning to your experiences through identification, assessment, and evaluation of information. The final results will be the production of photographic evidence, video, external analysis, new product interactions, and performance initiatives that have value beyond this course. You will design a portfolio to communicate experiential learning to faculty, employers and academic programs. In this 15 week course, students will explore Vermont’s food system while developing critical professional development skills as well as critical thinking skills regarding issues surrounding the environmental and social impacts of the food system. Through site visits, lectures, and coursework, students will be exposed to Vermont’s leadership in food systems work and begin to develop their own professional portfolio with an emphasis on their personal brand, goals, and capabilities. In this course, students will develop a portfolio of proposed goals for their time at NECI. They will develop writing skills through blog entries describing their visits around Vermont and will interview leaders in the food system. The course will culminate in a multimedia project that exemplifies their experience during their first term at NECI and represents critical components of the food system in Vermont as well as their own areas of interest. As part of their professional development, in addition to a focus on writing skills, interviewing techniques, and multimedia platforms, students will choose a Vermont business and write a cover letter and resume that is catered to this specific job and reflects their experiences thus far. Students will then revisit this assignment toward the end of their AOS or BA and adjust their cover letter and resume reflecting all of their gained skills and experiences. Preserving foods allows professional chefs to capture the quality of the season, support the local farming community and minimize the harmful environmental effects of transporting foods long distances. Experienced chefs know that by applying selected preservation methods to perishable food products they safeguard quality, minimize waste and maximize utilization. Cooking year round with locally produced foods can be a challenge, particularly in the harsh, temperate climate of northern New England. In this production based course, students will “capture the season” by applying a variety of preservation methods and techniques to “put food by” in ways that control food costs, maintain food safety, flavor and nutrition. Students will develop recipes using these foods and explore how to cost effectively incorporate them into contemporary menus year round. In this 15 week course, students will explore global issues in food and agriculture with an emphasis on resource management and distribution, conservation and sustainable development projects, workers’ rights and land ownership, climate change and crop production, and food sovereignty. This course will highlight specific case studies to examine contemporary issues in the global food economy such as the case of quinoa production in Bolivia, tomato growers in Immokalee Florida and their fight for fair wages, seed saving and the fight for crop diversity in India, banana plantations and pesticide use in Latin America, cocoa farmers and fair trade models in the Ivory Coast, and cooperative coffee farming in Costa Rica among others. Each week will focus on a specific case study with the final weeks of the course devoted to students choosing their own example for their final project. This project will require the student to think of an ingredient or product that he/she uses in the kitchen on a regular basis and trace its impact on the environment, community, and landscape from its place of origin. In addition to their final project, throughout the term students will re-evaluate their professional portfolios developed in their Exploring Self and Community course and incorporate weekly blog posts on each week’s theme into their portfolios in addition to updating their resumes, cover letters, and personal goals. The externship provides students with the opportunity to further apply and practice the information and skills they acquired during residency. Students set learning goals prior to the start of their externship, reflect on their progress throughout the internship, and provide documentation of their learning experiences. NECI maintains a broad database of local, national and international approved sites that are monitored and updated regularly. Externships are also available at NECI Students are strongly encouraged to pursue an externship at one of those pre-approved sites. Externships are also available at NECI including a specialized program that prepares students for work in Michelin starred restaurants at home and abroad. Degree program Externships require 495 hours of work experience at an approved site, Certificate programs require 135 hours. Students are required to maintain ongoing contact with the school during the externship program. As part of the internship program, students participate in an online course through which students receive ongoing advice and input from Career Services and their NECI instructors throughout their externship experience. Facility planning is an important from both theoretical and applied perspectives. Land, property and resources represent major components of the foundation of the industry. As future managers, it is imperative that students have a sound basic knowledge of property and the various resources, systems and services associated with it. This course covers important contemporary subjects such as sustainable planning and environmental management. It also covers the facility design and its impact on facility management , facility systems (include safety & security systems, water & wastewater systems , HVAC systems , lighting systems , laundry systems , food service equipment) and facility design (include lodging planning & design and food service planning & design). This course is an introduction to the basic concepts and standards underlying financial accounting systems. Several important concepts will be studied in detail, including: revenue recognition, inventory, long-lived assets, present value, and long-term liabilities. The course emphasizes the construction of the basic financial accounting statements - the income statement, balance sheet, and cash flow statement - as well as their interpretation. How does one create good flavor in food? What is good flavor? In this class, we will approach this subject from three different perspectives: (1) How to develop and maintain good flavor; (2) What denotes “balance” in food and beverage and (3) How cooking techniques affect the finished flavor of foods. These are the foundational questions that will be answered in this class designed to create an “educated palate”. In addition, students will work to develop their confidence in selecting appropriate beverages with foods based on simple taste, aroma and texture comparisons and contrasts. We will discuss through this course the physiology of how our senses, sight, taste, aromas, textures and sometime sound affect our perception of food and beverages. Much of the tasting experience in this class should enable the student to think more clearly about possible taste interactions with work done on their plate projects based on the theory taught in the course. 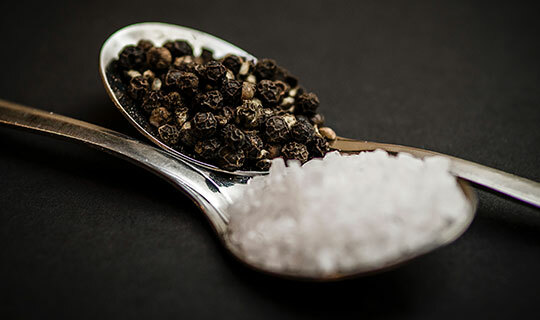 It is essential that students in the culinary arts know how and why different techniques create different flavors in foods and how they might interact with each other favorably or negatively. Students are introduced to essential components of hospitality, service and product knowledge in this comprehensive course. Emphasis is on the smooth and comprehensive execution of service aspects of a business that will distinguish an outstanding dining experience while contributing to profitability. Proper techniques in service execution, product knowledge, salesmanship and beverage service are supported by practical lab experience ensures a solid foundation in service to compliment any food service professional. Foundations of Baking is a fundamental class which will introduce students to the basic principles and science of baking. Students will focus in yeast breads, including and introduction to Artisanal breads, quick breads, (laminated pastry), classic pies & fillings, classic custards and creams as well as basic cake mixing. 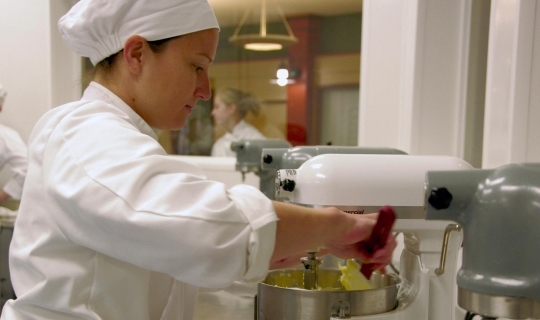 This foundation of baking class will prepare students for their first practicum internship. In addition to baking labs, this class will have a classroom component where students will learn the “how” and “why” of baking principles. Fundamental management principles are explored as students begin to transition from self-management to the management of others in a natural progression toward supervision and leadership. Course concepts include an understanding of industry averages, financial terminology, concept creation, and menu development and supervisory management. This course will satisfy the 30 hour management course required for ACF certification. This class is designed to help develop a sense of global food knowledge around the world, focusing on cuisines of regions of Asia, Africa and the Middle East. "Students will study the food products of these regions, the taste and flavors developed within those regions as well as key aspects of food styles, cooking techniques, menu development and food distribution within the regions. The study of Global Cuisines allows the students to understand the quality of food products within those regions, and importance of food sourcing, local, regional and national gardening systems, the pros and cons of global marketing, and universal understanding within those regions of the food systems, their problems, concerns and solutions to development and distribution of food within those regions. Global cuisines also enhance the student’s awareness of the importance of support of regional food sources and the necessity for understanding the policies and procedures of global cuisines, their trail around the globe and the adoption of those cuisines through the centuries and the continents." This course focuses on preparing students—both personally and professionally—for entering the industry as a manager. With an emphasis on personal, managerial, and human resources management skills students are prepared for applying these skills later in the program, and as they move into a business career. The course introduces students to both theories and skills, and provides opportunities to practice communication, presentations, and leadership. The course also covers the key employment and labor laws that will affect how students will manage and make decisions about issues involving discrimination, harassment, and disability policies and legislation. This course teaches creative thinking and problem solving techniques. Using a variety of tools and methods, students learn approaches that will give them the skills to truly “think out of the box”. Finding unique and unexpected connections while exploring problems from new angles will result in individualized and improved solutions. Increasingly organization survival and/or efficiency are related to the ability to acquire and maintain excellent information about itself and competing organizations. Information treated as a resource for strategic planning and operational management has a value like other assets in the organization. The information asset must be quantified and accounted for as such assets as land and equipment. This course will explore necessary management actions, which will insure that information is available, correct, protected, and archived in proper forms. The objective of this course is to meet the challenges which are seemingly unending. Information Technology Services departments will be required to increase system performance and improve availability while simultaneously cutting costs and improving quality, measured by customers’ satisfaction. In this class, students will learn about all aspects of the Cheese making process, from milk selection, to curdling, to salting, pressing, molding, aging and quality control. They will learn and practice the principles of making three families of cheese: fresh soft varieties, bloomy rind varieties and semi-hard cheese. Students will visit a local dairy farm and a cheese maker. There will be guided tastings of the cheeses of New England and the rest of the world. Pairing with wine, beer, and condiments will also be practiced. This course instructs students in the fundamentals of meat, fish, and poultry breakdown and portioning. Through lab assignments, discussions and lectures, students will understand the role of a butcher shop in a multi-unit food service operation and have the skills necessary to make significant contributions in this very important setting. In order to make informed, effective and financially astute purchasing decisions, all chefs must know basic fabrication of meat, poultry and fish as well as the variety of available market forms, seasonality, and related price fluctuations. Understanding the differences between locally raised, organic and commodity meats and poultry, and between wild, farm raised and sustainably caught or harvested seafood is critical in identifying and sourcing the right proteins for a given menu or concept. Additionally, students will gain certification in Seafood Sustainability after completing an on line class sponsored by the Blue Ocean Institute. Through a combination of classroom and practical activities, students will learn and practice the management skills need to successfully supervise a kitchen. Students will practice management skills including: ordering, receiving and inventory of product, scheduling and supervising staff, managing pre-meal meetings, expediting during service, conducting sanitation inspections and employee training. Growing a business beyond the startup stage can be equally as daunting and challenging a task as the creation of a business. However, to transition to this stage of growth as a small and medium size business requires the entrepreneur, owner/manager to adopt a very different, almost opposing, set of management skills to be successful. The course is focused on the challenges and opportunities of managing a growing company and emphasizes practical management methods and techniques. Failure is simply inevitable. We all make mistakes! The second part of the course focuses on analyzing failure and managing it to take advantage of it. Failure is demystified and also analyzed in a social context across different cultures. Finally, the positive outcomes of failure are discussed, such as failure boosted research in each field, influencing the designs of all models, and technological advancement has been contingent on learning from previous failures. Event and banquet service represents a major segment of the food service industry. It is the engine that keeps many hotel food and beverage departments viable and provides additional revenue source for restaurants, cafes and bakeries. This course exposes students to the skills of banquet/catering preparation and service, cooking methods and techniques within the framework of a variety of operations. Lesson topics include methods of preparation for banquet food, guest centered management and menu planning for the banquet Chef, event timing and coordination, buffet layouts and decorative display designs. Gross revenue, number of units, market share, profitability, geographical dispersion, corporate planning, cultural menu design, and communications - all of these concepts grow exponentially more important as a corporation grows. Decisions that used to be made over a coffee in the storeroom now need to be discussed by the stakeholders in the boardroom. This course will introduce the student to the concepts and challenges of managing several units, franchising and other unique issues that face today's global corporations. Students will increase their knowledge of basic human nutrition through a variety of classroom activities, readings, projects and guided web based research. They will learn about macro and micronutrients, absorption, digestion and bioavailability. They will also explore diet and recipe assessment methods, food labelling, menu development, portions and satiety. Students explore the day-to-day operations of a restaurant in this course. Through discussions, guest lectures, and hands-on projects, they develop the skills and insight needed for establishing a comprehensive operations plan for a business. The overriding objective of the class is to create a forum for students to think critically about the information presented, and to apply that information within the parameters of a business concept & NECI’s operations. Regardless of the type of plan pursued, the critical indicators for success will be the same. The application of program content, creative thought, professionalism, persuasive and engaging writing and presentation skills, coupled with thorough operational and financial knowledge of the proposed concept is essential. The approach to learning utilized in this class will require strong organizational, research and multi-tasking skills, as well as an ability to work independently. As a result, you will thoroughly understand the operational and financial decisions required by an upper level manager or owner in this industry. The value of a plan that is developed at this detail is that it contributes to a level of information and communication within an organization that supports ordinary people to be extraordinary employees. This course provides a comprehensive analysis of individual and group behavior in organizations. Its purpose is to provide an understanding of how organizations can be managed more effectively and at the same time enhance the quality of employees work life. Topics include motivation, rewarding behavior, stress, individual and group behavior, conflict, power and politics, leadership, job design, organizational structure, decision-making, communication and organizational change and development. This course aims to improve students understanding of human behavior in organization and the ability to lead people to achieve more effectively toward increased organizational performance. This class builds on knowledge gained in Specialty cakes 2 and takes the students into more a designing aspect of creating a table show piece or center display piece. Students will use specialized and more advanced mediums as well as using more advanced techniques such as molding, modeling, template cutting and cake carving. Students will learn designing and building techniques using different gum pastes, pastillage and poured sugar. Theory of designing, learning the art of color, patterning with texture, building to a ratio, color palette, depth perception are also covered. In order for students to learn to apply the skills they are learning in technical classes NECI provides actual food service outlets for students to engage in practicum internships. These practicum internships are supervised by entrepreneurial, educationally minded chefs and managers supported by professional staff. Students in practicum internship will be scheduled for work shifts in their practicum site by their practicum coordinator. In the practicum students will apply skills learned in the previous term’s coursework by participating in the daily operations of the practicum internship site. This connection between coursework and practicum work will be reinforced by a daily task oriented meeting and weekly practicum internship group meeting. Students must complete a minimum of 18 hours per week to be scheduled by the practicum coordinator. Each term serves as a prerequisite to subsequent term’s practicum internship. The goal of this course is to learn how to use economic analysis to reach reasoned conclusions about the big issues of the day from the implications of globalization to the causes of economic growth, financial crises, and unemployment. Selling value, influencing others, and developing long-term relationships are important attributes of quality leaders. This course centers on gaining an understanding of the sales process, as well as, build polished selling skills to properly address the interests of company constituencies. Selling principles are used to influence management, negotiate with suppliers, and motivate employees. Additionally, “Relationship Selling” methodology is covered. Students study key skills for success including listening skills, building credibility, influencing the buyer's perception, appropriate responses, common mistakes, and conflict resolution to promote high caliber sales and negotiation skills. The purpose of this course is to introduce students to the world of retailing and merchandising from a managerial viewpoint. Students will study the elements that comprise the retail mix, including types of retailers, multichannel retailing, consumer buying behavior, retail marketing strategies, selecting retail site locations, supply chain management, merchandising, pricing, store management, store layout & design and customer service. Students beginning their careers in the food service industry must learn how to purchase, store and utilize food product while keeping it safe. Students receive an overview of how food is purchased, received, stored and distributed in a commercial food service operation. Students will be introduced to proper food management systems used to control the flow of food through a food service operation with an eye toward preserving food safety, quality and profitability. Students will study product identification, availability, seasonality, price, and the role they play in quality, safe food. Through a series of demos, tastings and class discussions, students will be able to assess the quality of various proteins, produce, baking and dry goods. In addition, they will learn how to price those items accordingly and quantify make or buy decisions through evaluation and yield testing. This course also includes a study of food borne illness and accident prevention and provides students with working knowledge of the principles of food microbiology; major food borne illnesses, allergens, standards enforced by regulatory agencies, and applied measures for keeping food safe. The course will culminate with the student earning the National Restaurant Association’s ServSafe Manager Certification as well as Servsafe Allergen Certification. Certifications are a requirement for graduation. This course will satisfy the 30 hour sanitation course required for ACF certification. The field of culinary arts has a strong emphasis on the sciences. The student’s ability to make the necessary connections between theoretical principals and the applications of such scientific concepts will heighten their ability to understand more complex culinary principals. The application of science falls under the headings of sanitation, nutrition, taste and flavor, food science and math concepts and applications. Through practice and application, the student will begin to develop an understanding of the scientific concepts relating to the food and beverage industry. In Science Connection students will explore the scientific principles that guide fundamental cooking techniques. Through a series of lessons and labs students will use the fundamental concepts of chemistry, biology and ecology to make connections to all aspects of the food continuum. Student evidence will consist of professionalism observations, daily lab observations and lab journals. Sous Vide cookery has become a standard method in the modern chef’s repertoire. In this course students will learn, understand and synthesize new applications for sous vide cookery. Through a series of classroom based lessons and lab based demonstrations and activities students will learn the importance of proper sanitation, bagging method, temperature regulation and record keeping to keeping sous vide foods safe and ensuring accurate cooking. In lab based activities students will learn how different cooking methods and ingredients can be combined with sous vide cookery in creative ways. Students will learn the history, theory and safe practical application of sous vide cookery. Spanish language skills are essential to the success of professionals in American society today. This series of courses focuses on basic grammar and proper use of vocabulary. Topics include human interest issues and introduction to the Hispanic culture, and everyday typical conversation. Lessons and assignments include creative writing, review of artworks, conversations and oral presentations. Students will create a well-ordered and displayed portfolio in which they will collect their work. Assessment will be based on observations, participation, portfolio and a final test. Throughout the course series students are immersed in the Spanish language with a continued focus on daily applications and increasing expectation around the comfort, frequency and complexity of language use. This class builds on the foundations of Specialty cakes 1 but the emphasis will be on more advanced techniques in building layered cakes emphasis is placed in designing and decorating using contemporary mediums such as rolled fondant and chocolate paste as well as the use of cutters and more specialized equipment. Students will also learn how to build and decorated a wedding cake as well as the theory behind cake order sheets, costing and building a cake contract. This course examines how managers use data for systematic business problem-solving. Topics include collecting data, describing and presenting data, probability, statistical inference, regression analysis, forecasting and risk analysis. Special emphasis will be given to computer techniques, especially using Microsoft Excel, for statistical analysis and problem solving. Common business processes and business skills practiced are gathering and organizing data, quantitative data analysis, forecasting, decision-making under uncertainty and communicating or presenting results. This course introduces the key concepts, tools, and principles of strategy formulation and competitive analysis. It is concerned with managerial decisions and actions that affect the performance and survival of business enterprises. The course is focused on the information, analyses, organizational processes, and skills and business judgment managers must use to devise strategies, position their businesses, define firm boundaries and maximize long-term profits in the face of uncertainty and competition. Strategic Management is an integrative and interdisciplinary course. It assumes a broad view of the environment that includes buyers, suppliers, competitors, technology, the economy, capital markets, government, and global forces and views the external environment as dynamic and characterized by uncertainty. This course explores a variety of mediums and techniques that are used in producing a wide array of sugarcraft items for displays and presentations. Focusing strongly on theory, students will enhance their understanding of working with a variety of decorative sugarcraft mediums, such as gumpaste, fondant, marzipan, gingerbread, modeling chocolate and royal icing. Students will focus on visual design, color theory and presention to create themed assignments. As the Farm to Table Movement has matured, its influence has grown beyond the arena of fine dining restaurants to all manner of food service operations. The Farm to Institution movement encompasses a range of large scale operations from schools and colleges, to health care operations to business and industry accounts. Increasingly, consumers in all these settings want to know the source of their food, how it was raised and by whom. They also want restaurant quality, freshly prepared food that is healthy and meets a variety of dietary requirements. Large operations have responded by developing on site restaurants that accomplish all of these objectives. This lab based course will focus on production methods used in large scale food service operations. Instruction focuses on the basics of knife skills, cooking methods, soups and sauces, batch cooking skills, sanitation, station organization, recipe reading, and menu planning. Additional focus is placed on the organization of food production in a food service operation with a population with diverse dietary needs: vegetarian, vegan, and various food allergies. Lessons will also explore purchasing guidelines for local and regional sourcing and will review resources available through organizations such as Farm to Institution New England (FINE), Healthy Food in Healthcare and the Real Food Challenge. Viennoiserie is category of European Pastry that is recognized globally. This course is designed to give students an introduction to Viennoiserie which includes breakfast pastries, laminated and rich dough. Skills learned in this class will include: Lamination techniques, shaping, baking and finishing of breakfast pastry as well as puff pastry and Brioche. This class encompasses both technical skills as well as creativity. Man has been cooking with fire since the beginning of time and wood fired grills, ovens and hearths have always been used in the cooking repertoire. In recent years cooks and bakers around the world have rediscovered the range of possibilities from to flavorful wood grilling to high temperature roasting and baking to gentle braising and drying. This lab based course will cover the design, maintenance and selection of wood fired grills and ovens, as well as a full range of cooking preparations. Building on the foundational skills of Artisan Breads, students will focus entirely on Artisan breads that require lengthy fermentation and time to develop their flavors. They will build their own sourdough starter and from this design their own unique bread. In addition students will learn different ways to make and shape artisan breads. Along with this students will explore scoring and decorating breads as well as using stencils for design. Using mainly flour, water and salt, students will see how to manipulate these simple ingredients into many wonderful combinations. In this course students will explore advanced chocolate and sugar techniques in the application of candies, confections, petits fours and truffles. Students will concentrate on mastering several chocolate tempering techniques to complete showpieces, with a menu of supporting edible components. Students will develop themed special events with menus, table displays and showpieces to emphasize more refined procedures and presentations. Students will incorporate costing of a themed project within an allotted budget, challenging them to assume greater understanding of cost management. Students will learn the art of creating both traditional and contemporary desserts, setting of a display table as well as learning the theory of European classics, deconstruction and reconstruction of traditional pastry items. Students will learn about the theories, procedures and ingredients used in designing and preparation of dessert making as well as different plating techniques. Through classroom and lab activities students will cover elements in building a dessert table to showcase large pastry platters and designing a brunch dessert table. This course is designed to assess the psychology of different markets and to understand purchasing patterns and consumer decision making. This course focuses on the theoretical and practical aspects of business activities providing a framework to assist in informed decision-making. An understanding of business principles prepares students to become productive members of society. It also provides the opportunity for students to develop entrepreneurial and managerial skills necessary to prosper in a local, regional and global dynamic business environment. An introduction to the American Legal System along with those issues that affect business most, including the judicial system, employment law, contracts, business organizations and debtor-creditor relations are an integral part of understanding constraints associated with business ventures. It engages students in conducting research which helps to improve their communication and critical thinking skills and creates an awareness of business social and economic responsibilities. This course will provide a good foundation for further study of Business and assist students in the development of the requisite skills, competencies, attitudes and values that are critical for success in today’s business environment.